What can we say about Carlisle Rogers? Plenty it turns out. As a yank hailing from the States, he has been travelling around Australia since his 20's. As a journalist and photographer with over 15 years of experience, he has freelanced for some of Australia's most renowned publications including The Age, Sydney Morning Herald, Roling Stone, Australian Geographic and Outback magazine. And if that wasn't enough, Mr Rogers has travelled over 100,000 km all over Australia, published 56 issues of his magazine 4WD Touring and filmed four action-packed series of television. You can pretty much say he is one of us now. We sat down with him to talk about how his freelancing experience has shaped 4WD Touring, how on earth he comes up with his philosophical musings, and what his favourite tune is when he is driving around. 1. So Carlisle, in your own words what makes 4WD Touring Australia magazine and TV show so great and what differentiates you from the rest of the pack? There’s an old saying: To be great, don’t do what great men did…seek what they sought. This brand stands out because we’re looking for meaning, not just experiences. We’re looking for that path of self-discovery on the road. 2. You have quite a bespoke way of words, where and how do you come up with your philosophical life musings? I grew up reading a lot. My heroes carried little black notebooks into the beyond, instead of capes. Absorb enough of any language and you can become fluent. The need to communicate, I think, to share what I’ve experienced, drives everything I do. You can’t just brush against the edge of whatever lives out there in the outback, that jagged, impossible, unknowable mystery, and not try to share the experience. 3. What’s your dream rig? I’m driving my dream rig, Ghost! I can see myself in a customised Unimog when I’m a bit older…but for now Ghost will take me anywhere in the country, and more importantly, will guarantee I get back home. It’s good to be able to camp next to some far-flung wave and still have the power I need to charge my laptop, all my camera batteries and still work. 4. What are your top three gadgets you have installed in your vehicle? REDARC Manager30 Battery Management System – I couldn’t work on the road without being able to charge everything, keep my fridge running, have lights around camp and generally have a modicum of comfort in the wild. ARB driving lights – I like to drive at night…but that’s not really safe or pleasurable without these. Warn winch – I don’t use it very often…but when I do, it always saves the day. 5. What is your best off-road destination and where would you love to go? The first one I’ll split: Cape York for real 4WDing adventure, and the Kimberley for sheer beauty away from the highway. Where my ambition lies on the map doesn’t have a name yet. For me, it is the next place I lose myself, the place I don’t expect, which blows my mind. 6. You’ve been a freelancer photographer and journalist for a number of years, how has that helped you in creating this unique magazine? No man is born to a trade without practice. I used to stay up nights trying to find the secret to good writing, looking for some shortcut to brilliance. There are no shortcuts…but the long hours spent looking for one ended up being enough. Learning photography on film helped too. In the digital age, mistakes are much, much cheaper, which means one can afford to make more, to learn more. 7. What does ‘living the dream’ mean to you? I used to wonder this myself, driving down a track in the middle of nowhere, sitting by a seaside campfire. One day it hit me. Surfboards on the roof of my LandCruiser, the sun setting over white dunes after a day spent chasing waves, I had that peculiar sweet exhaustion, and I realised I was doing it, in that moment: living my dream. Veal osso bucco, wrapped in layers of foil with fresh vegetables and spices. You dig a hole on the beach, drop in some hot coals, then the veal packets, then more coals. Bury it and wait about four hours. Best feed of my life, on a beach in the Kimberley at sunset. 9. What is the best part of your job and what is the hardest? Freedom is the best part. The ability to follow my heart, to do fulfilling work. The hardest part…the sheer amount of work that goes into it all. 10. 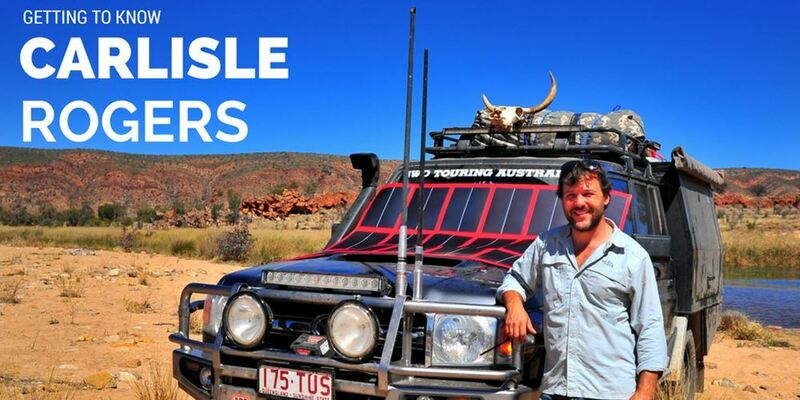 What is your number one tip you’d give to someone embarking on a 4WD tour around Australia? Buy the best gear you can afford. A breakdown is worth so much more lost money and time than whatever you saved in the first place. 11. Favourite tune to play on the drive? Either Pink Floyd’s Wish You Were Here, Blind Melon’s Soup, or Portugal, The Man’s Evil Friends. 12. How do you unwind after a hard day of filming? Ideally, a swim in an ice cold freshwater rock pool. But we usually work until close to midnight on the road…which means unwinding is just crawling into the swag and passing out. 13. We’ve been working together now for many years, what do you feel makes this partnership so successful? When I started this company, I dreamed that I would only work with the best brands, with companies and with people that embodies an ethos of integrity. It was a risky move at the time, but you are always going to be judged by the company you keep. REDARC embodies everything I personally and professionally believe in. The way Anthony runs the company continues to inspire me and the products are the best in the world. That’s pretty amazing for a small Australian company out of South Australia. The gear has never let me down! I’m extremely honoured that REDARC respects the work we do here, and continues to support 4WD Touring Australia.